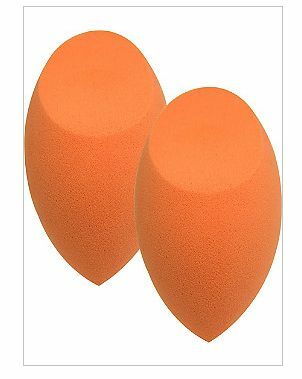 After years of using those little latex free sponges to apply my foundation I upgraded to the Beauty Blender. After using the Beauty Blender a few times, I was in love. It made my foundation look super flawless. The only downside is the cost - $20 per sponge. A few people told me that they liked the Real Techniques Miracle Complexion Sponge. I decided to try it out after my last Beauty Blended croaked. I bought a 2 pack at Ulta for under $10.99 during a BOGO sale - already winning! I have seen them elsewhere but Ulta seems to always have them on sale plus even if they are not - they qualify for the promotional coupons you get in the mail. Besides the price I like the shape. The flat side is really good for applying foundation. The pointy flat edge really gets into the sides of the nose and is thin enough to do nose contouring. After using the sponge I can note some differences between the brands. This sponge stays damp no matter how much you ring it out. Also it absorbs foundation more, if you like a less coverage look, it may be better suited for your needs. It washes off and stains less in my opinion than the Beauty Blender which stained no matter how much I washed it. It is a good sponge and has multiple uses. Besides foundation I use it to blend in bronzer and concealer. Would I buy them again? Yes. In the summer when I am more drawn to light foundation these are better for the look/feel I want. The price is also a big factor. They are an upgrade from the little sponges many of us use (or used). If you want to try a sponge without the hefty price tag then pick up these today. Thanks for the tip! I hadn't heard of these and hate how expensive the Beauty Blenders are, so I'll have to give this brand a try.